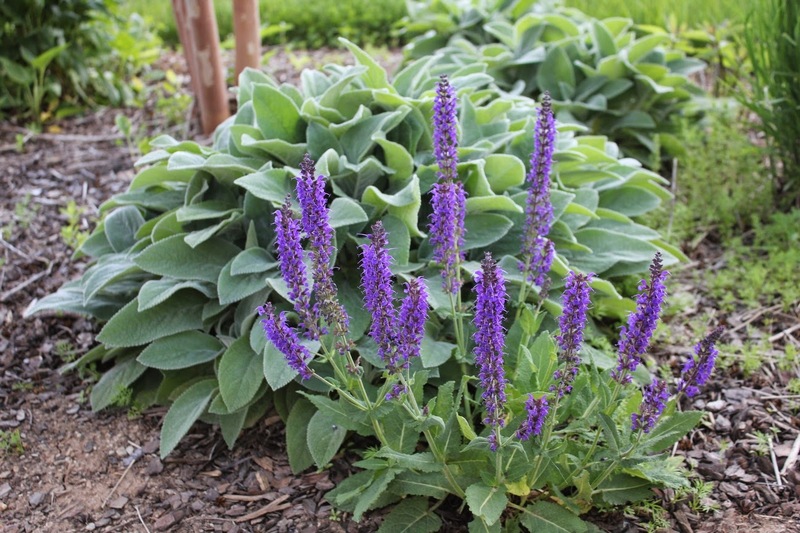 Garden of Aaron: In Full Swing - Clematis, Penstemon, Sumac, Sage, False Indigo and More! 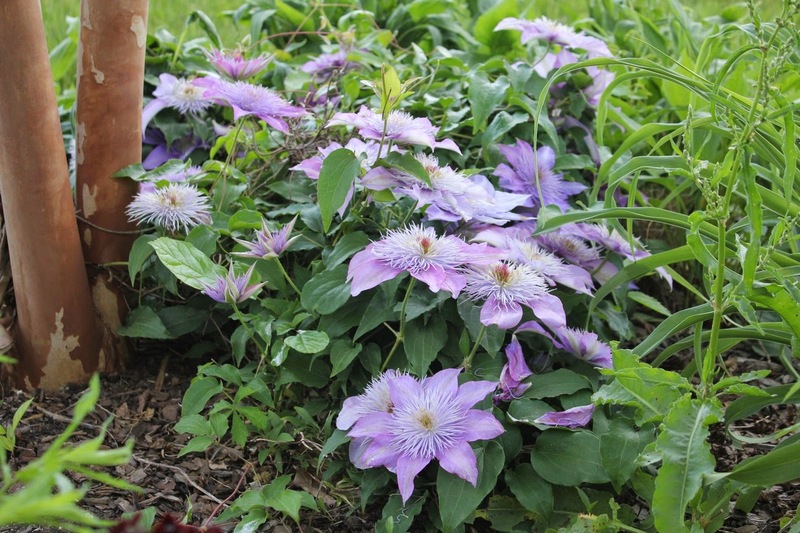 In Full Swing - Clematis, Penstemon, Sumac, Sage, False Indigo and More! Things are in full swing in the garden - bees are buzzing, flowers are blooming, leaves are expanding, plants are growing, everything there is life (except where there is death). I apologize for the lull in posting photos. My camera is currently traveling overseas (along with my wife), but my kindly neighbor Christian generously lent me his camera so that I could capture some scenes from the early May garden. Abelia x grandiflora, dwarf cultivar. I'd thought it was 'Rose Creek', but I think it was mislabeled, so I'm not sure of the cultivar. Whatever it is, it seems to be settling in nicely during its first year in the garden. I don't usually like bright yellow plants, but I like the contrast here against surrounding greenery. 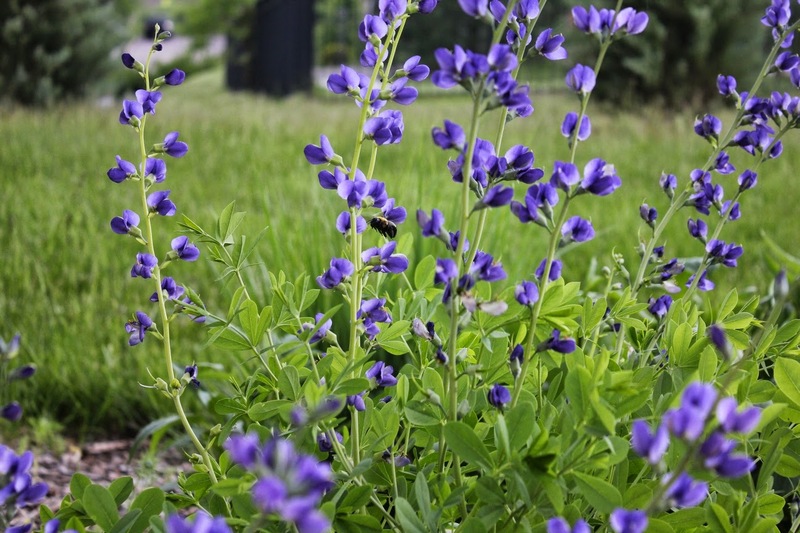 My favorite plant in the garden these days is Baptisia australis (blue wild indigo). In its third full year in the garden, it has sent up multiple stalks of pretty blue flowers that (as you can see here) attract bees! 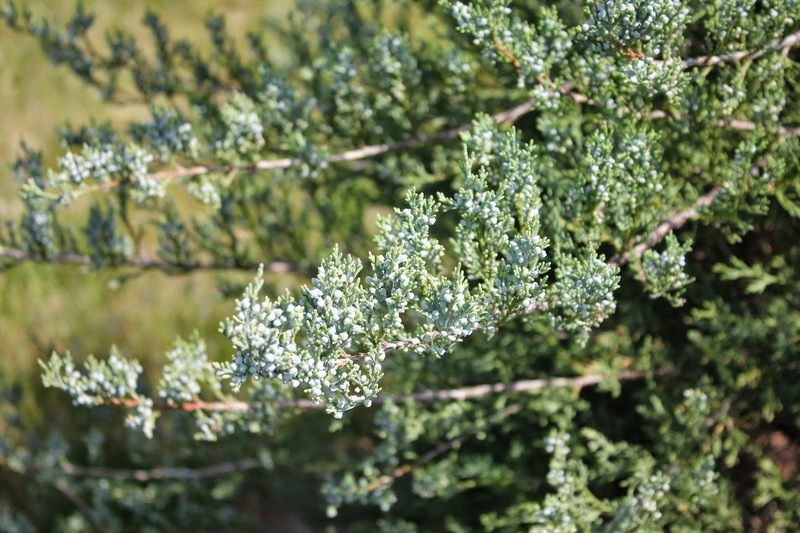 The Burkii eastern red cedars (Juniperus virginiana) are loaded with berries/cones. The branches were coated with rust fungus earlier during our wet spring, but that issue seems to have abated (at least for now) as the weather has turned drier and warmer. 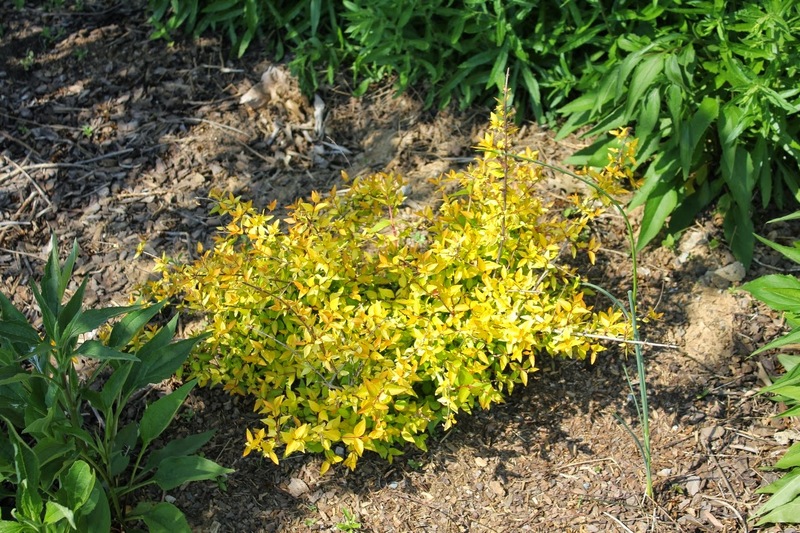 Nothing too exciting here - Forsythia x intermedia 'Lynwood Gold'. 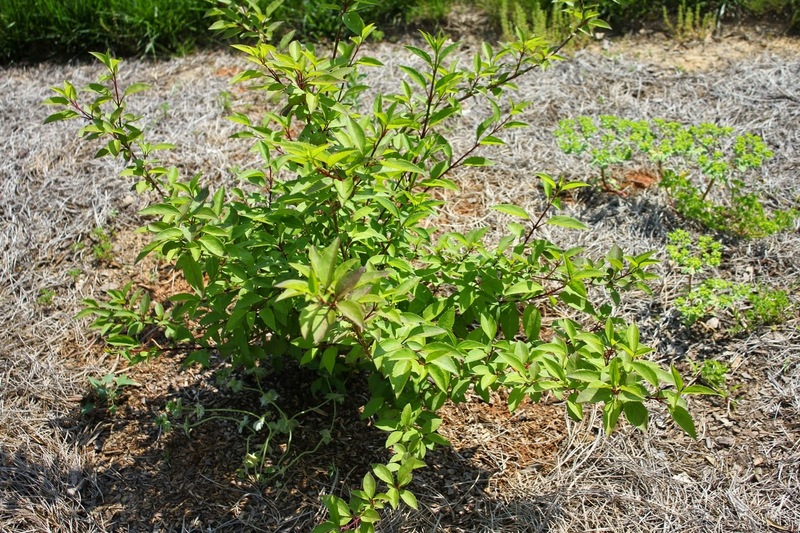 But I must admit that the shrub looks very healthy. The foliage was a lovely shade of green earlier in the spring. I'm not over-the-moon on Forsythia. It's totally overplanted and the flowers seem relatively useless in terms of supporting wildlife, but I have to give it props for toughness. What happened here!? 'Lemon Queen' perennial sunflower is not looking her best. I need to investigate further, but my initial suspicion is some sort of fungal rot. It's not a pretty picture, but I believe gardening blogs should honestly show the good, the bad and the ugly. 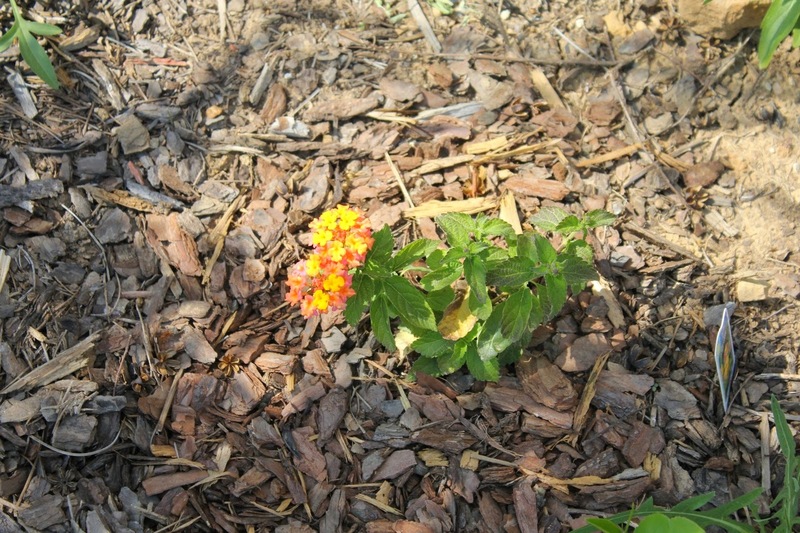 Lantana camara 'Miss Huff', first year in the garden, first blooms. Panicum virgatum (switchgrass) 'Northwind' -- This is my second year with switchgrass in the garden. I cut back the old stems myself in March. It seems to me that in a normal-to-harsh winter here, I could easily wait until the end of March or even the beginning of April to make such a cutback. 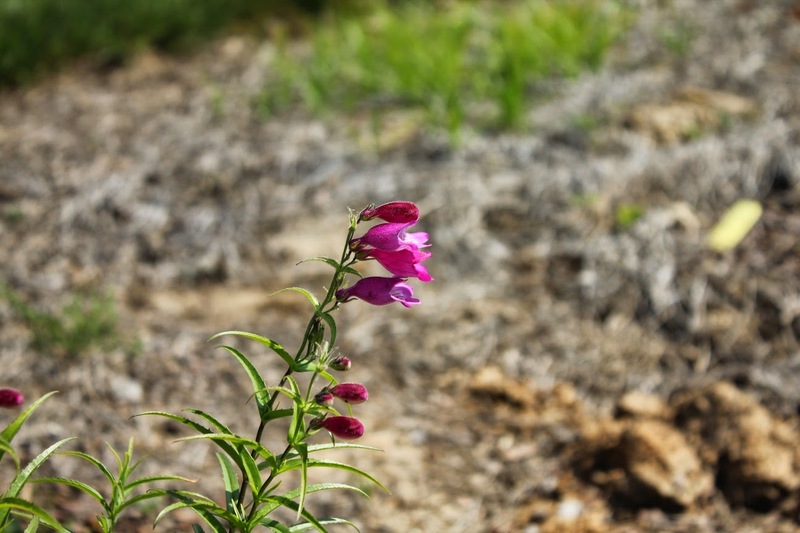 The old stems look good all winter and into spring, so the cutback is only needed to make way for new growth. 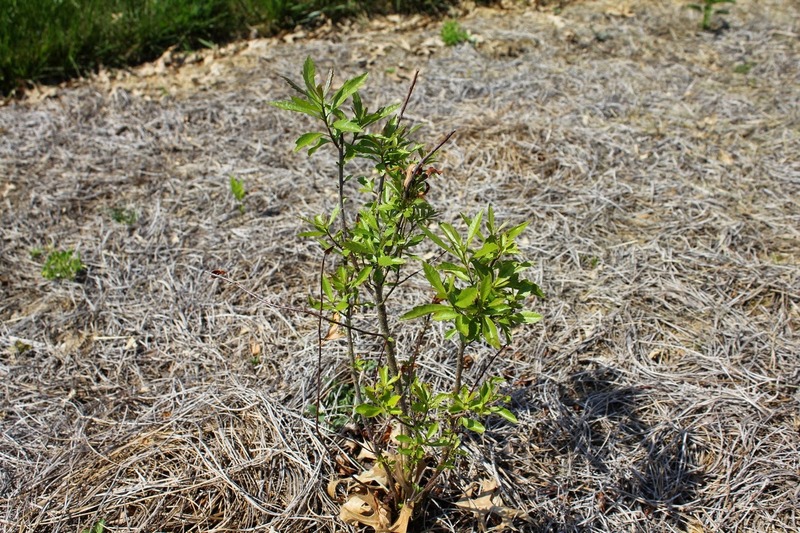 But that new growth doesn't start in earnest until mid-April. 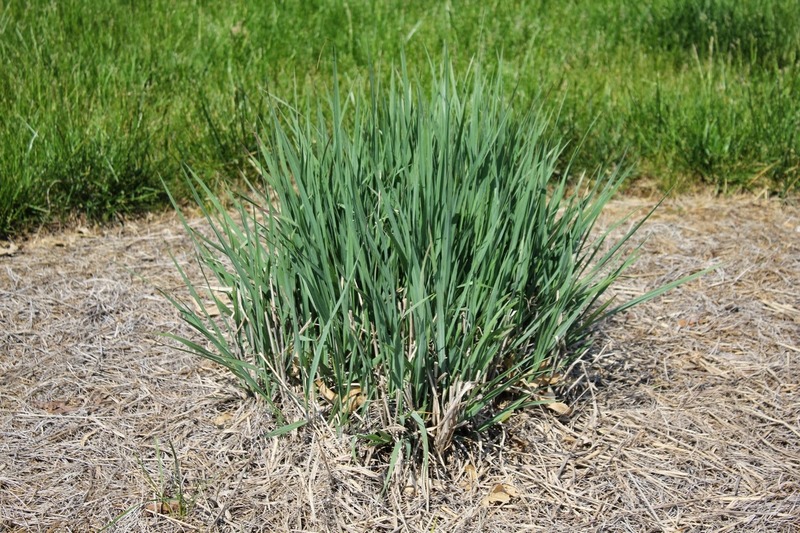 Cut back your grasses too early, and you have relatively unattractive stubble mocking you for a month. 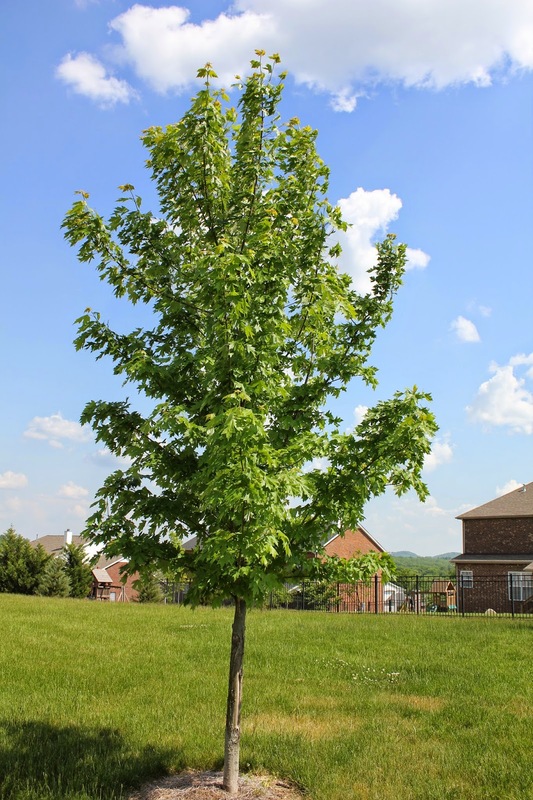 Acer rubrum (red maple), not sure which cultivar, but whatever the name, it's turning into quite a nice little tree. As long as the deer don't try ripping up the bark again (like they did a couple of winters back), I hope it will be OK. 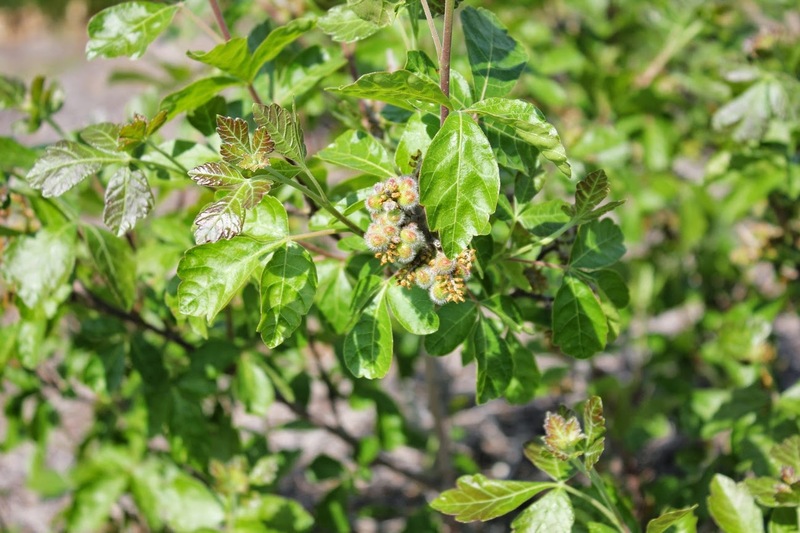 Fuzzy berries forming on fragrant sumac (Rhus aromatica) 'Gro-Low'. The small yellow flowers that preceded the berries seemed to be a big hit with all sorts of small pollinators (probably a motley crew of bees, wasps and flies). 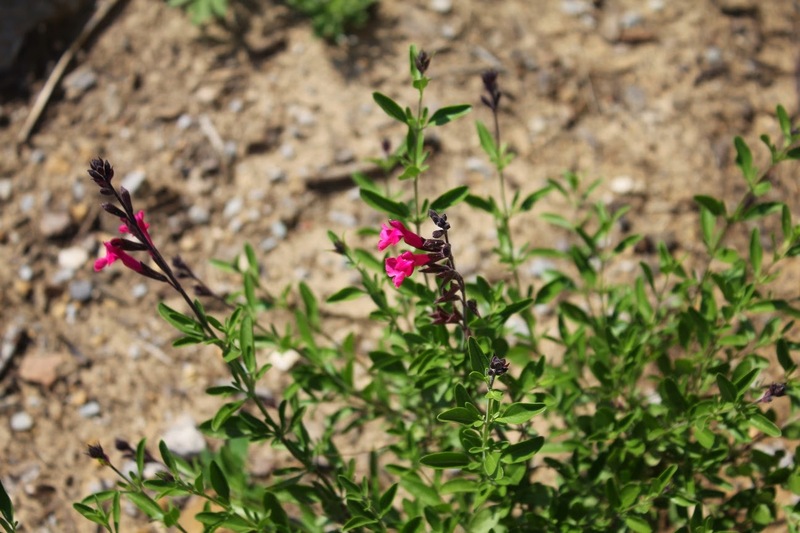 Salvia greggii (autumn sage), not sure whether this is 'Flame' or 'Rose Pink', but in either case both survived the winter (I was holding my breath since they're rated marginally hardy in Mid-Tennessee) and have started blooming. Last year, the autumn sage flowers attracted hummingbirds. As with the azaleas I inherited at the front and side of the house, I feel like this ornamental sage ('May Night'?) looks good for a couple of weeks and then looks like Death warmed over the rest of the year. Still those brief bursts of beauty - especially in the Spring - have won it a place in the garden for now. The lamb's ear 'Helene von Stein' in the background looks good most of the year, including now. 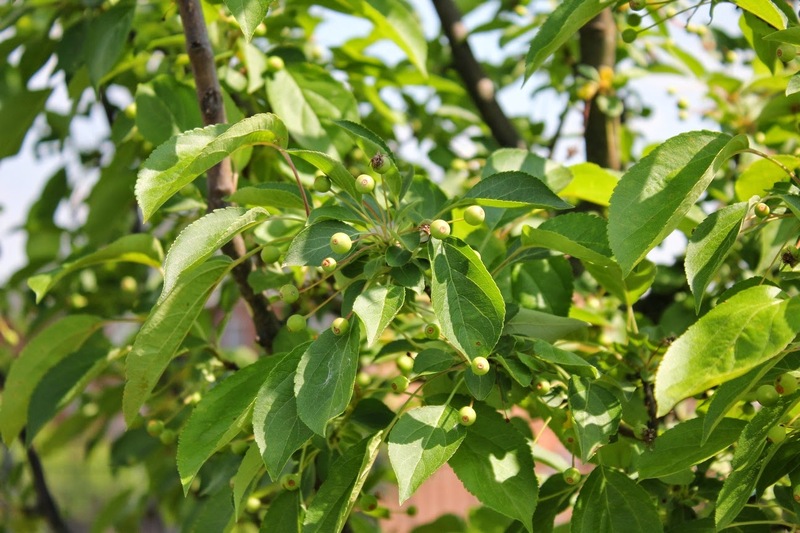 Looks like there should be lots of crabapples this year on the 'Sugar Tyme' crab. 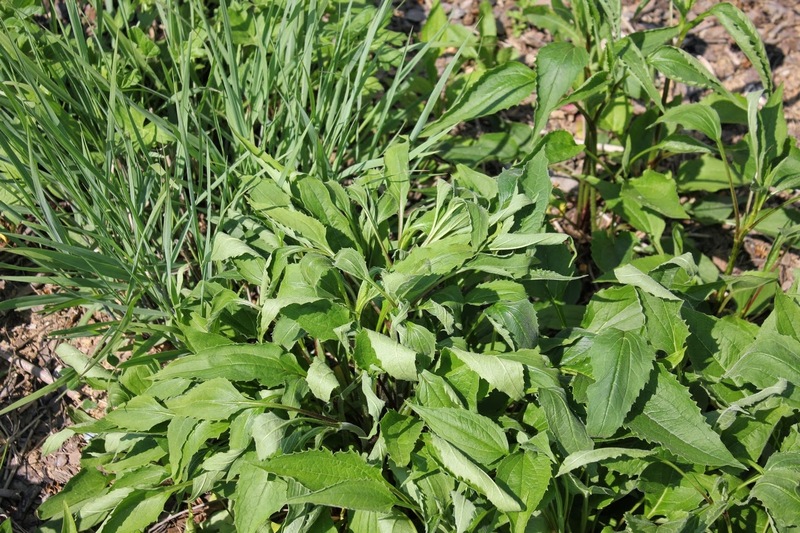 Purple coneflower (Echinacea purpurea) wilting in early May. Not a good sign of drought tolerance when we're still 5-6 weeks away from the official start of summer. 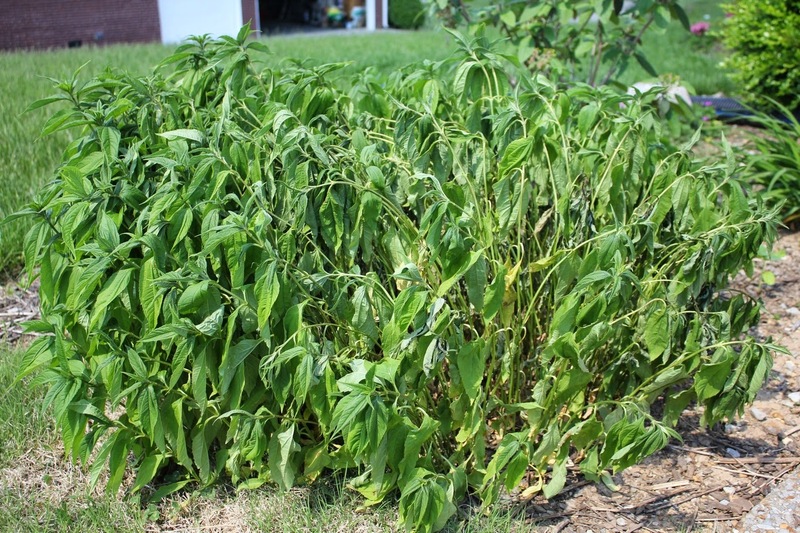 As with the 'Lemon Queen' sunflower, I'm not sure what happened here, but a portion of the Hyssopus officinalis (hyssop) seems to have wilted out practically overnight. 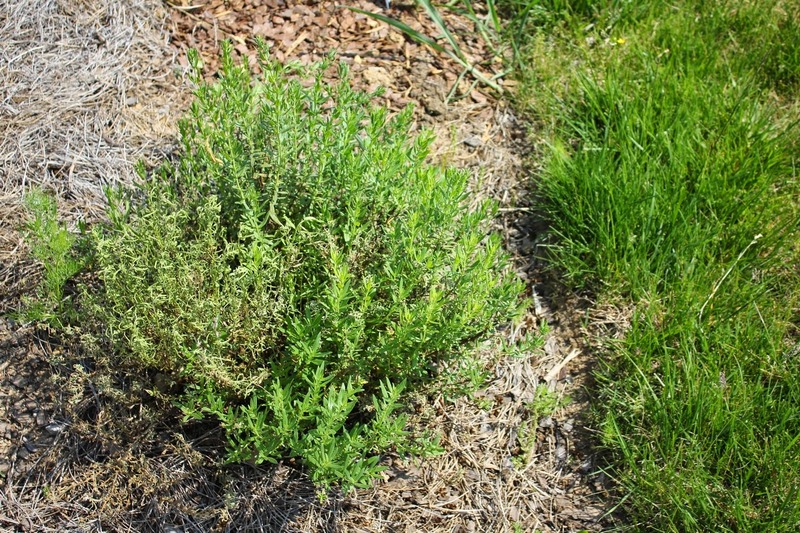 Hyssop is a fast grower, so I'll try just trimming out the damaged section and hoping for a recovery. Stay tuned, more photos coming soon from the front garden!